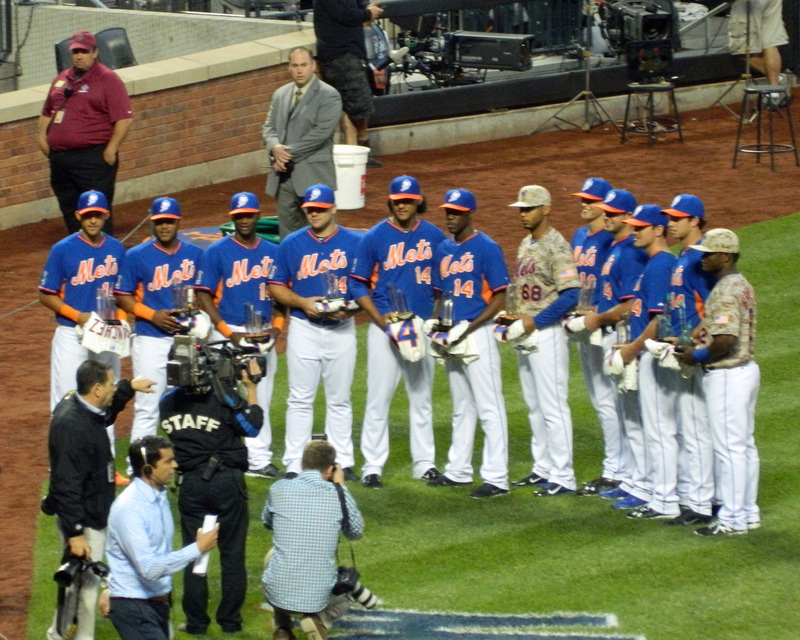 The New York Mets recognized this year’s group of Sterling Award winners prior to last night’s game. Dilson Herrera and Dario Alvarez have already started to make contributions at the major league level, albeit in a very limited way. I’d like to believe they will only get better, and players like Steven Matz, Matt Reynolds and Kevin Plawecki will join them sooner rather than later. But here’s the thing – we call minor league players “prospects” for a reason. Sometimes they don’t work out at all. Sometimes success is just reaching the major leagues and sticking for a little while in some role. Very, very rarely do they turn out to be stars. Josh Satin was the organization Player of the Year. Last night, Keith Law tweeted that pitcher Jacob deGrom was a better hitter than Satin and I don’t think too many folks disagreed. Darin Gorski was the organization Pitcher of the Year. He has yet to reach the major leagues. Chris Schwinden was honored at the Triple-A level (back when the Mets’ affiliate was the Buffalo Bisons). He made six starts for the Mets in 2011 & 2012, and is now pitching for the Lancaster Banrstormers in the independent Atlantic League. Jeurys Familia was honored for Double-A Binghamton. Despite last night’s meltdown, Familia has been a key contributor to the Mets’ revamped bullpen and could be a future closer. Matt Harvey was honored for Single-A St. Lucie. An All-Star in 2013, Harvey finished fourth in the National League Cy Young Award voting despite missing the season’s final month. We’re all hoping he can regain his dominant form after undergoing Tommy John surgery last fall. Pitcher Angel Cuan was honored for Single-A Savannah. He was injured for part of the year and pitched in just 10 games with unimpressive numbers. Cuan has not advanced past the Double-A level. Infielder Daniel Muno was honored for the short-season Single-A Brooklyn Cyclones. In 2012, Muno was suspended for 50 games for violating Minor League Baseball’s PED policy. This year, in the hitter-friendly Pacific Coast League, Muno hit .259 / .372 / .418 for the Las Vegas 51s. Catcher Cam Maron was honored for the Rookie-level Kingsport Mets. He spent most of 2014 with the St. Lucie Mets, were he had a pretty good year – .282 / .387 / .362. Rafael Montero was honored for the Rookie-level Gulf Coast League Mets. Although he’s had mixed results in limited major league exposure in 2014, many fans are counting on him to be part of next year’s rotation. My guess is that he will be pitching out of the bullpen or in Las Vegas for another year, unless Alderson is unexpectedly active in the trade market this winter. The takeaway? Alderson inherited a farm system that wasn’t completely barren (all of these Sterling Award winners except for Muno and Montero pre-date the current front office regime.) Of the nine, we have one potential star, two potential key contributors, four players who are still “prospects” to one degree or another, a fringe major leaguer and one player who is out of affiliated baseball. That’s actually pretty good. It would be nice if the group of players that was honored last night turned out as well three years from now.